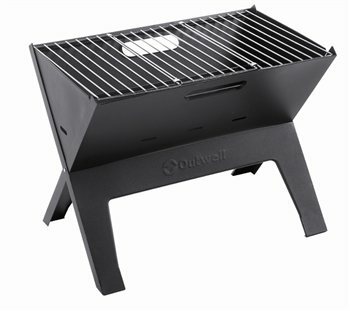 Cooking on a barbecue using charcoal is easy and uncomplicated with our neat Outwell Charcoal Grills. The easy-to-transport Calvados Grill is joined by the new larger 16” Calvados L with full standing height. The Cazal Fire Pit and larger Cazal Fire Pit transform campsite evenings with cosy campfires as night falls. Our Locking Tongs and 3-in-1 Grill Cleaner are barbecue essentials for practical cooking and hygiene.. Breaking out the barbie takes on a whole new meaning with our effectively simple Cazal Portable Grill. Perfect for those that enjoy all the performance and taste of food cooked on real barbecues. Cazal portable is absolutely perfect for me. I've been searching for camping equipment that is lightweight, practical, functional and affordable. 1. Extremely compact. 2. Small but ample size for two. 3. Very easy to clean and pack back into box for travelling. 4. After cooking I sit a pot of water on the grill to heat for the dreaded dishes, whilst I'm waiting for the water to heat I have the perfect excuse to sit and enjoy a chilled shampers, win win!! A replacement for a small barrel camp bbq, mainly as the grill is higher off the ground so more comfortable to cook on and of course the added bonus of it folding flat. The grill space is generous, probably good for a 4 person cook, and deep enough to get good sized logs burning into the night. Seems sturdy and steady enough, the first camp at easter will test the steel (hopefully won't warp or flake), as will be used both for cooking and as a fire pit. This is our second Outwell Grill!Our first was from 2009 still useable though, but I was afraid it wouldn´t last another season. It is used almost every day during holidays, i.e. everything from 20 - 30 days! Really impressed with this being so compact, and folds up with the grills inside. Cooked well and the size was fine for 3 of us. However, disappointed that the black coating has peeled off after the first time of using! So now doesn't look quite so smart....! That's the reason for the 3 stars. However we used quick light lump charcoal that caused it to twist. The top grille then fell through. A bit of work with pliars moved the lip in and all is well.